What It’s About: Martians invade the Earth. Can anything stop them from annihilating mankind? Why Watch it Today? : On this date in 1938, Orson Welles famously broadcast his version of H.G. 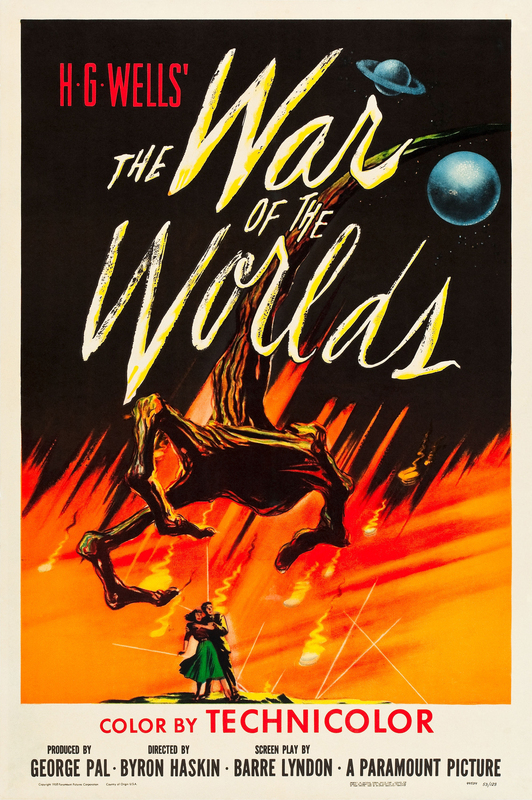 Wells’ The War of the Worlds, which, thanks to its “live broadcast” format perfectly suited to radio, created a panic in some parts of the country as listeners tuned in late and did not realize they were listening to a piece of fiction. In 1953 George Pal produced his own adaptation, updating it for the Atomic age and creating the basic template for the Alien Invasion film used even today. Although it’s more of a sci-fi film than a horror film, as a child the clips used on TV specials aired around Halloween chilled my bones, and the book, which I read quite young, did an even better job. Other Choices: Why not listen to Orson Welles’ broadcast and see what the fuss is about? Or maybe you’d prefer to read the book? This entry was posted in Adaptation, Aliens, Based on a Book, Based on a Radio Show, Event Film, Movie of the Day, Sci-Fi, The Original, War with Aliens and tagged "germs kill the monster", Air Force, Ann Robinson, Best Film Editing Nominee, Best Sound Recording Nominee, Best Special Effects, Byron Haskins, Cecil B. DeMille, Cedrick Hardwicke, force field, Gene Barry, George Pal, H.G. Wells, Les Treymane, Mars, Martians, mob, nuclear weapons, Paramount Pictures, Paul Frees, riot, scientists, square dance, stock footage, U.S. Army.